We love the warm weather and so do the pesky flies! 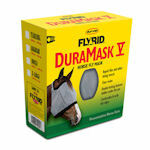 Be prepared for fly season with this month’s subscriber coupon for 20% off any DuraMask fly mask! These durable fly masks come in a wide variety of sizes and colors and will keep your horse’s face and eyes free from annoying flies. Just print out the coupon to keep your horse happy this fly season. Keep in touch with the happenings at Rainbow Ag by “liking” our Facebook Page! This entry was posted on Monday, May 2nd, 2016 at 12:29 pm	and is filed under News, On The Right Lead Newsletter. You can follow any responses to this entry through the RSS 2.0 feed. Both comments and pings are currently closed.